Linfield manager David Healy hopes his side's County Antrim Shield semi-final win over Carrick Rangers can act as a springboard for their league campaign. The Blues have collected just four points from a possible 18 in their last six Premiership games but beat Carrick 2-0 at Windsor Park on Tuesday night. "I asked for 11 strong men to turn up for our semi-final and that is what I got," enthused Healy after the victory. "Hopefully this result can act as a kick-start for the rest of the season." 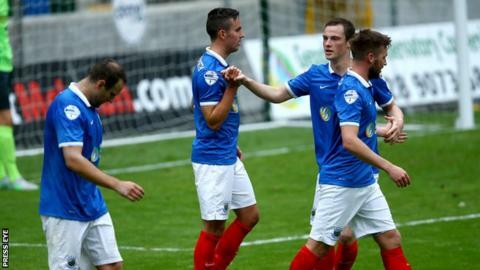 Linfield, who have dropped to fifth in the table, will be without suspended midfielder David Kee on Saturday for the first of four meetings with Ballymena United in the space of five weeks. The sides will meet at Windsor Park in an Irish Cup fifth round tie on 9 January, in the County Antrim Shield final at the same venue on 12 January, and then in a further league encounter at Ballymena on 23 January. The Sky Blues, who have two wins from their last seven league matches, have defender Gareth Rodger serving a one-match ban, while Willie Faulkner is out injured after suffering a fractured arm in last week's win over Warrenpoint Town. Meanwhile second-placed Cliftonville, unbeaten in 13 league outings, have an injury doubt over Chris Curran for their trip to face Glentoran at the Oval. Glenavon manager Gary Hamilton this week celebrated four years in charge of the Lurgan Blues and his team will be favourites to see off basement strugglers Warrenpoint at Mourneview Park. Hamilton's outfit have suffered just one defeat in seven league games, a run which has seen them advance to fourth position in the table. Ballinamallard brought to an end a run of five successive league defeats by securing a 1-1 draw at Linfield last week but face an important match against Carrick Rangers at Ferney Park. Carrick boss Gary Haveron has pinpointed forward Miguel Chines as an important figure in his club's battle to avoid the drop, following an impressive display in the reverse at the hands of Linfield in midweek. "Miguel is a big threat for us and we want him to chip in with the goals we need to help keep us in the league," said Haveron. Dungannon host Portadown in the day's other fixture, with Swifts manager Rodney McAree keen to urge his charges to greater efforts. "We have to get out of the habit of losing games. We are not conceding a lot of goals and we are not being beaten by big margins but we need to pick up points quickly," argued McAree.